I love surprises, especially ones that involve flying to unknown destinations, and I commend you for taking the initiative to plan such a great gift. I’ll suggest Italy for you and your sweetheart, because there you can enjoy history and culture while incorporating a bit of adventure on the side. Your dates, however, make your budget a little difficult to achieve, since August and September are considered high season for Europe. Plane tickets can cost almost as much as you want to spend for the entire trip. For instance, I priced tickets from New York to Florence in August starting at $827 (with taxes and fees) per person. If you can be flexible when you go, you can save by traveling in the fall off-season, where I was able to find flights from New York to Florence starting at $643 (with taxes and fees) per person in October. This may not seem like drastic savings, but every dime counts when you’re shooting for a low-budget getaway. Plus, hotels are also more affordable during the off-season, so you can save there as well. The one drawback is the weather may be chillier than in the summer months, but not enough to stop you from enjoying the outdoors. If you can travel in the off-season, I recommend two options: Florence and Tuscany, or Rome and Abruzzo. When it comes to mixing outdoor activities with cultural finesse, Tuscany provides a countryside perfect for pedaling, mountains made for picnics and small hikes, and a seaside that demands relaxation and fun in the sun. It’s up to you which area you choose to explore, but since you will begin your journey in Florence, you’re guaranteed to get a strong dose of culture. The city offers endless options for fine dining, art museums, historical sites, and unique shops. Plus, you can always plan a short excursion to one of the other art cities in Tuscany by taking a day tour. 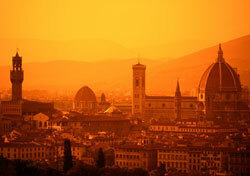 Rooms in Florence start at about $50 per night in the off-season, depending on the type of hotel you choose. If you’d rather spend your time in the great outdoors, Italy’s oldest national park of Abruzzo is certain to deliver. You will begin your trek in Rome, where airfare from New York City starts at $642 per person in October. Rome itself can be an adventure—simply rent a moped and try to maneuver the city streets—but the city also offers an insurmountable amount of historical architecture, local cuisine, art galleries, and high-end shopping. Plus, most of the sites require a good deal of walking and exploring, so you’ll definitely get your exercise. Rooms in Rome start at about $68 per night in the off-season, depending on the type of hotel. Spend several days learning about the city’s culture before setting out for the natural scenery of the park. You can either rent a car to drive to Abruzzo, which lies 70 miles east of Rome, or you can opt to take the train. A rental car from a provider such as Hertz starts at about $110 for 24 hours. Though city-to-city train tickets (Rome to Pescara, with a stop in Sulmona) may be the more affordable option through a company like Trenitalia, it can be a bit confusing trying to book tickets online. If your travel dates are set in stone, and you’re willing to forego Europe, I can suggest several other destinations that might be more in line with your budget. For instance, Costa Rica, and Napa Valley or Bar Harbor, Maine are three places which combine a great deal of romance, culture, and adventure in one neat little destination. I hope your surprise goes off without a hitch and you enjoy your trip! Please keep me updated on what you decide to do. As for my other readers: Do you have a suggestion for Mike on a destination for the adventurer guy and cultural gal? Have you been somewhere in Italy that might be more suitable? Tell us what you think by filling out the form below.